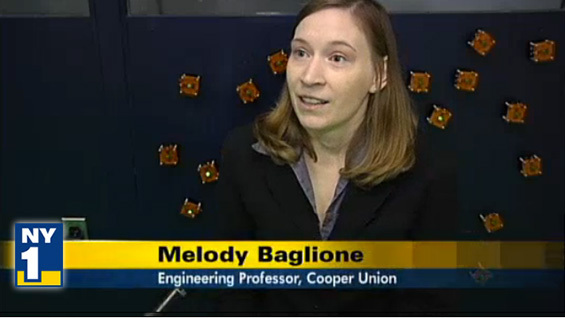 The cable news channel NY1 has created a spot about Prof. Melody Baglione's Interactive Light Studio project that began at the Cooper Union. Installed at P.S. 347, the nation's only public school that teaches both the hearing-impaired and the hearing-enabled, the studio aids young hearing-impaired children to visualize sounds. "I thought it would be great to be able to create technology and devices that could help these students learn about sound and interact with sound, something that normally would be intangible for them," Prof. Baglione says in an interview. Time Warner Cable customers, or those in an area serviced by TWC, can view the video on the NY1 website.